Joyce Glasser reviews Loving Vincent (October 13, 2017), Cert 12, 91 min. There were two biopics at the London Film Festival (October 4-15) that stood out for their attempts to merge form and content, thereby transforming the typically reverential and pretentious, and sentimental artist biopic into something fresh, stylish and revealing. The first is Redoubtable, a gently humorous look at Jean Luc Godard’s second marriage that resembles a Godard movie. 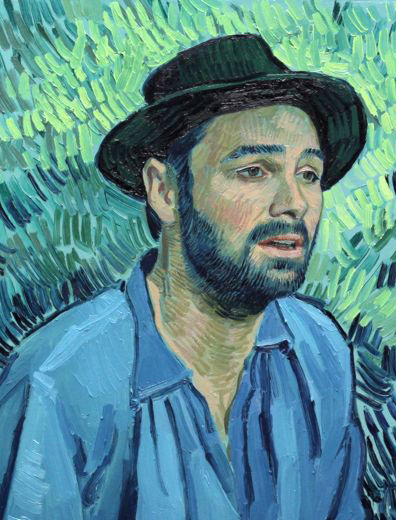 The second film, released this week, is Loving Vincent , an ambitious, audacious and largely successful Vincent Van Gogh biopic that literally brings his paintings to life and life into his paintings. 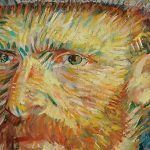 This approach might not appeal to everyone, but it is ground-breaking animation that uses the Dutch artist’s pulsating impasto technique to explore the mystery of his tragic death. The brainchild of Dorota Kobiela and Hugh Welchman, live action scenes with a top-notch cast were shot frame-by-frame against plain backgrounds, and some 65,000 of these frames were hand-painted over as if the characters are walking through a Van Gogh landscape or room. These sequences were then photographed and animated. Given the amount of work this entailed,125 artists from around the world were recruited, each contributing a minute or less to the film. The effect is unsettling at first and some viewers might never get accustomed to the continual billowing movement and the ever changing colours. As you get into the story and start recognising old friends, it becomes not only fun, but informative and absorbing, for Polish animator Kobiela and Producer Welchman (nominated for an Oscar for the wonderful, animated short film Peter and the Wolf) wanted some substance behind their style. If Vincent’s paintings are in every frame, Vincent (Robert Gulaczyk), the man, appears only in flashbacks, shot in black and white to avoid confusion. The story begins a year after his death. We are in Arles where Vincent lived from February 1988 to May 1989. He then spent a year in an asylum in St Rémy before making the final move to Auvers. Postman Joseph Roulin (Chris O’Dowd), Vincent’s only real friend in Arles, decides to find some employment for his wastrel, 20-year-old son Armand (Douglas Booth). Vincent made a now famous portrait of the Postman and painted a lesser known portrait of Armand. In the painting he wears a vibrant yellow jacket that Booth, rather more handsome than the portrait suggests, wears. 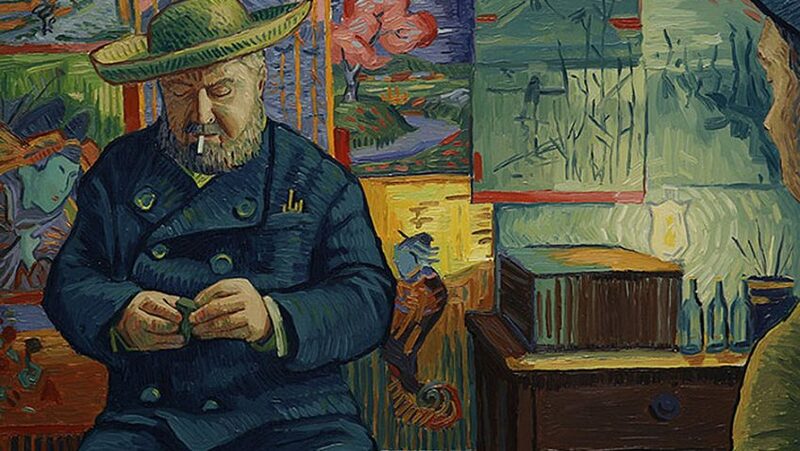 Armand heads for Paris where he meets with Vincent’s paint supplier, Père Tanguy (John Sessions) – and Van Gogh lovers will quickly see another famous portrait. Tanguy has bad news about delivering the letter. Theo died, aged 33, on 25 January 1891, shortly after his son was born and just six months after he buried Vincent in the cemetery of Auvers. As Tanguy tells Armand about the remarkable bond between the brothers and about Vincent’s background, Armand becomes genuinely interested in learning why Vincent would have taken his own life. This is the ‘coming-of-age’ part of the film as what began as a dreaded, remedial assignment from his father becomes a voluntary mission and then a young man’s obsession as he considers his own meagre accomplishments. Instead of going back to Arles, Armand heads for Auvers and questions all the people who could shed light on Vincent’s last three months. Many of these have been immortalised in his paintings, as have the very buildings that Armand passes by and through. A sympathetic, laid-back boatman (Aidan Turner from Poldark) – from the Banks of the River Oise painting – provides what is either a vital clue or a red herring that leads Armand to the home of Dr Gachet (Vincent’s first portrait of Dr Gachet sold for $82 million in 1990). Armand’s suspicions are aroused in the doctor’s frosty home and his housekeeper (Helen McCrory) can’t wait to show him the door. A little romance finds its way into the story as Armand and the innkeeper’s knowledgeable daughter, Adeline Ravoux (Eleanor Tomlinson), take a liking to one another. Auvers is a short train journey from Paris and, relatively untouched since Van Gogh lived there, is well worth the visit. The town is so proud of its famous connection that there are reproductions of his paintings in front of the church, the inn and the town hall. One can stand in the room where Vincent died and visit the fields where he may or may not have shot himself, all within a short distance from the train station. Oddly, Armand does not pay his respects at Vincent’s grave. Perhaps the creators omitted this because Vincent did not, obviously, paint it and had no cause to go to the cemetery. Today, visitors will see not one, but two Van Gogh grave stones side by side. Right before her death in 1925, Theo’s remarkable widow moved her husband’s body from Utrecht to lie beside his beloved older brother. 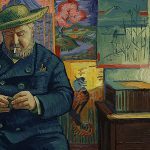 Loving Vincent – the world’s first fully painted feature film!